OUR WEBER STOVE remains defiant and tough during one of the wettest Irish summers on record. And it's a welcome piece of Americana in our Cashel garden. Once every five years while growing up on the east coast of the States, I traveled to the midwest in the back of our family station wagon and skirted Huntley (Illinois) where big, flat circles of steel are doused in lubricant, stamped in a toggle press, welded, trimmed, coated with electrically charged enamel, and heated to 1700 degrees Fahrenheit before it looks as it should. 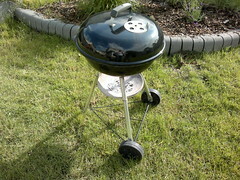 Our Weber grill doesn't look much different than the one our family had in the mid-60s. They look like the bottom of a Coast Guard buoy (that's how they originated) and they help make the summer outdoor living season better than it already is. I stoked up our Weber stove to make some chicken skewers while listening to The Restaurant Guys talk about cocktails. The most interesting man in the world (Johnny Schuler) is on the audio clip below--part race car driver, clever mixmaster, and lovely conversationalist--who will charm you about Pisco Porton, the brew I intend to buy the next time I'm in Soho. Have a listen--and stop buy my place if you see smoke wafting across the Golden Road in Cashel some summer's evening. Ryan Bradley -- "Where Grills Are Born" in Fortune, August 27, 2012. Bernie Goldbach collects links about food.